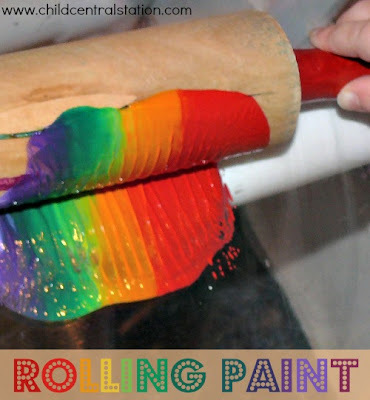 I saw this wonderful idea over at Learning For Life, where the children had the opportunity to roll paint on a table with rolling pins! (She saw the idea over at Casa Maria's Creative Learning Zone, somehow I missed it there!) I thought... How cool is that! So, of course, we had to try it and adapt it for ourselves. and rolling! Some of them rolled with rolling pins, some of them with paper towel tubes.. and some with both. We rolled until we didn't want to roll anymore. And some of us just played with the paint on the table. It was another great day for process art exploration! Oh I love the idea of doing this on plexi glass! I have to say this was our favourite activity yet - might just have to break out those rolling pins again! Your plexi-glass table is awesome. Do you have more pictures of it or more information? Is the PVC frame used only for the plexi-glass? AWESOME!! Thanks for sharing! !